Smart Spin Storage system is so easy to use, you could even find a storage container blindfolded. The unique design of the Smart Spin Storage System solves the problem we have all faced of not being able to find the right lid. The Smart Spin Storage System is designed with 1 size lid that fits all 3 sizes of the storage containers! That means you don’t have to worry about any more lost lids. And, because the lids are all the same size, they stack easily to save space. In addition, the containers are see through, spill-proof and microwave and dishwasher safe. The Smart Spin Storage system will help you organize your kitchen and save space. Just slide, spin and store! Smart Spin Storage containers holds an enormous amount of food, yet takes up about the space of a coffee maker. 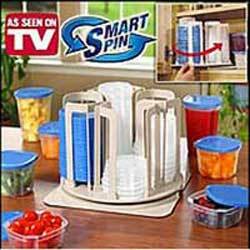 The Smart Spin System consists of 3 different size containers that stack easily in the Organizer. The system takes up so little space, because of the Smart Spin Organizer and the way they are stacked to save space. The containers are easy to open with easy peel lids for your convenience. The smart Spin Storage System works to save you space anywhere -- whether it is in your cabinet, drawer, shelf, or on your countertop. Smart Spin System will help keep you organized in the kitchen. Just slide, spin and store!